For 2016, the new Sync 3 infotainment system replaces the problematic MyFord Touch system, and a rearview camera is now standard for all trim levels. Since its introduction in 2009, the Ford Flex has defied definition. Is it a minivan, an SUV or a wagon? Whatever you label it, the Flex continues to deliver a ton of space, utility and comfort. 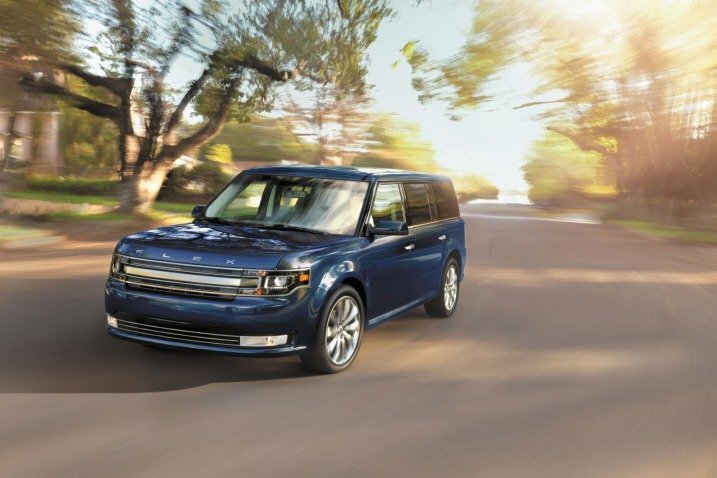 For the most part, the 2016 Ford Flex returns unchanged, with one significant upgrade. Pretty much since Day One, the MyFord Touch interface has been criticized for its complicated operation, unintuitive menus and slow reactions to inputs. All of that looks to be in the past with the introduction of the newSync 3 interface this year. Gone is MyFord Touch’s quirky, quadrant-based layout, replaced by a more conventional and responsive touchscreen with pinch-and-swipe capability like a smartphone. The 2016 Flex also features a rearview camera as standard equipment for all trim levels. Thankfully, all that made the Flex a hit remains the same. Even though the Flex’s cargo capacity trails some rivals on paper, the space itself is very usable, thanks to the car’s boxy overall shape. Passenger space is also excellent, even for adults in the third row, and the high comfort levels allow for effortless long-distance road trips. Add to that the wealth of available features and a powerful turbocharged engine option and the Flex should easily make your short list. Of course the Flex isn’t alone in this class, and it’s challenged by some very strong rivals. Mazda’s CX-9 has been completely redesigned and promises the same driver engagement that made its predecessor so praiseworthy, plus a much-improved interior. The Toyota Highlander also gets high marks for its all-around goodness and an available hybrid model. The roomy GMC Acadia is another solid pick among high-capacity crossovers, though it hasn’t aged as gracefully as the Ford. Whatever you decide to call it, the 2016 Ford Flex is worth a look if you need an excellent hauler of people and goods. The 2016 Ford Flex is a large crossover/wagon that can seat either six or seven passengers and is available in SE, SEL and Limited trim levels. The SE trim standard features include 17-inch alloy wheels, automatic headlights, rear parking sensors, heated mirrors with integrated blind-spot sections, rear privacy glass, a keyless-entry keypad, remote keyless entry, cruise control, an auto-dimming rearview mirror, air-conditioning, a leather-wrapped tilt/telescoping steering wheel, cloth upholstery, a six-way power driver seat with manual recline and lumbar, 60/40-split folding second-row seats with an auto-folding passenger side, 50/50-split folding third-row seats, a rearview camera, Bluetooth, a 4.2-inch touchscreen, Sync voice activation and a six-speaker CD player with auxiliary and USB inputs. The SEL trim dresses up the Flex with 18-inch wheels, upgraded brakes, foglights, chrome exterior trim, keyless entry and ignition, remote start, dual-zone automatic climate control with manual rear controls, wood interior trim, heated front seats, a 10-way power driver seat, a six-way power front passenger seat and the Sync 3 infotainment system with an 8-inch touchscreen, satellite radio and a second USB port. SEL models are eligible for the 201A option package that adds a 110-volt power outlet and a power liftgate. The 202A includes those items along with puddle lamps (integrated into the side mirrors), adjustable pedals, a blind-spot monitor, rear cross-traffic alert, leather upholstery (vinyl for the third row), driver memory settings and an upgraded seven-speaker audio system. At the top of the range, the Limited trim includes the 201A and 202A packages plus 19-inch wheels, xenon headlights, LED taillights, power-folding mirrors, automatic wipers, additional metallic exterior trim, a wood-trimmed steering wheel, upgraded wood interior trim, a navigation system with real-time traffic (optional on SEL) and a 12-speaker Sony audio system with HD radio. Available Limited options include the 301A package (adding an automatic parallel parking system, adaptive cruise control, frontal collision alert, a power-adjustable heated steering wheel, a 10-way power front passenger seat, cooled front seats and power-folding third-row seats). 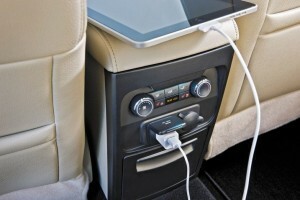 Additional options, depending on trim and configuration, include 20-inch wheels, roof rails, a tow package, a panoramic sunroof, a refrigerated second-row center console compartment, heated second-row captain’s chairs, inflatable second-row outboard seatbelts and a rear entertainment system. The standard engine for all 2016 Ford Flex models is a 3.5-liter V6 that produces 287 horsepower and 254 pound-feet of torque. A six-speed automatic transmission sends power to the front wheels by default, but all-wheel drive is an option for SEL and Limited trims. The EPA estimates fuel economy at 19 mpg combined (16 city/23 highway) for the front-drive model and 18 mpg combined (16 city/22 highway) with all-wheel drive. The Limited trim is eligible for the optional turbocharged EcoBoost 3.5-liter V6 that increases output to a heady 365 hp and 350 lb-ft of torque. All-wheel drive is standard with this engine, as are steering wheel-mounted shift paddles. In Edmunds testing, an all-wheel-drive EcoBoost Flex Limited accelerated to 60 mph in 6.2 seconds, a sizzling performance for a mainstream three-row crossover. Remarkably, fuel economy is unchanged at 18 mpg combined (16 city/22 highway). Properly equipped, the Flex can tow up to 4,500 pounds, regardless of engine choice. Standard safety features for all 2016 Ford Flex models include antilock brakes, stability and traction control, front side airbags, full-length side curtain airbags, integrated blind-spot mirrors, rear parking sensors, a rearview camera, emergency telematics via paired cell phones and Ford’s MyKey system that monitors the vehicle and allows owners to set certain limitations and alerts for valets and teen drivers. Optional inflatable second-row seatbelts are available for all Flex trims. A blind-spot monitor with rear cross-traffic alerts is available on SEL and standard on the Limited. Paired with the Limited’s optional adaptive cruise control is a frontal collision warning system that pre-charges the brakes for maximum responsiveness, but does not brake automatically like some rival systems. In crash testing conducted by the Insurance Institute for Highway Safety, the Flex earned the top score of “Good” in the moderate-overlap frontal-offset and side-impact categories, as well as the roof-strength and head-restraint tests. It received the second-best score of “Acceptable” in the small-overlap frontal-offset impact test. In Edmunds brake testing, a Flex Limited came to a stop from 60 mph in 120 feet, which is shorter than average for the class. The 2016 Flex’s boxy shape translates to a wealth of interior space, including genuinely adult-friendly accommodations in all three rows — a rare achievement, even in this size class. 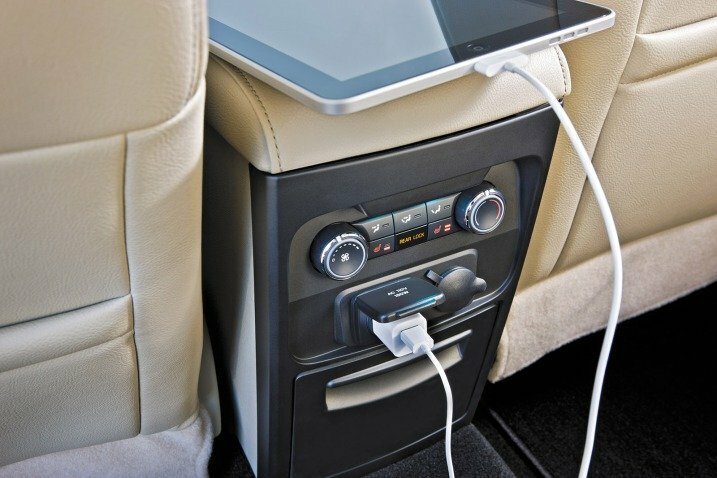 Accessing the rearmost seats is made easier by the auto-folding second-row passenger seat, while opting for the reclining-and-sliding second-row captain’s chairs adds a nice dose of luxury with available seat heaters. A middle-row center console refrigerator is also offered, though it can only hold a few beverage cans at a time. Front-seat occupants will be particularly impressed by the Flex’s high-quality materials, which remain above-average for the segment and wouldn’t look out of place in the Flex’s Lincoln platform-mate. Perhaps the biggest complaint about previous Flex models concerned the problematic MyFord Touch infotainment system. With the new Sync 3 interface, the layout is simpler and responses are quicker. Ford has arrayed the system’s virtual buttons at the bottom of the 8-inch touchscreen, and they’re pretty easy to decipher and operate from the driver seat. You can also pinch and swipe for certain functions, just as you would on your smartphone or tablet. There’s 20 cubic feet of cargo space behind the rear seatbacks, which may not seem like much for such a large vehicle. In real-world usage, however, a deep well and numerous carrying hooks make up for the modest dimensions. If you keep the third row folded flat when it’s not in use, you’ll have a much handier 43.2 cubes at your disposal, while folding down both rear rows opens up 83.2 cubes. That’s smaller than some rival SUVs, to be sure, but still highly functional thanks to the tall roof, flat load floor and squared-off shape. For the majority of drivers, the base 3.5-liter V6 should be adequate, but a Flex loaded to the brim with passengers and cargo will tax that engine. The turbocharged EcoBoost engine certainly solves that problem, and it’s downright fast on the open road, accelerating into arrest-me range with astonishing ease. In addition to the power bump, the EcoBoost adds a hint of athleticism with a slightly stiffer suspension. Of course, the hot-rod Flex commands a hefty price premium, but if you’re looking for some excitement in your family hauler, it’s well worth the stretch. With such a strong focus on utility, it’s no surprise that the Flex generally prioritizes comfort over responsive handling. That said, the Flex’s steering is responsive, and this boxy bus is rock-solid stable on the highway. Even over rough roads, occupants are well-isolated from ruts and bumps. 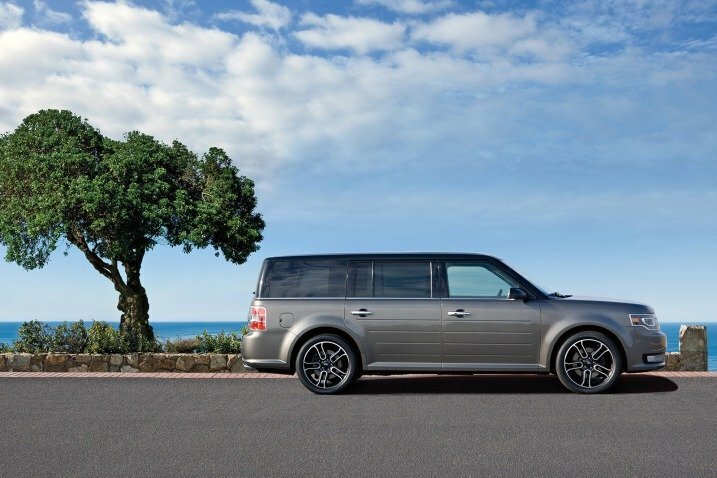 Whether you’re tackling the morning carpool or a coast-to-coast trek, the 2016 Ford Flex makes for a rewarding companion.